The villa is set over one floor and is accessed via a typical Canarian garden. There is a sunny pool terrace at the front while inside there are 2 bedrooms (1 double and 1 twin), 2 family bathrooms, kitchen with dining area, lounge (with sofa bed for 2 additional guests if required). If additional beds are required there is 2 sofa beds. Villa Rosamar can sleep up to 6 people. The private swimming pool (heated free of charge during the winter months) is set at the front of the villa and is surrounded by a pleasant sunbathing area. There is also an electric awning that opens next to the pool - to provide additional shade if required.Sunbeds, shades and outdoor furniture are included. We had a great time at the villa, beds were very comfy, pool was in the sun for most of the day. Ideal for a family holiday. The area is very quiet yet only 10 mins walk from local bars and shops, we would love to stay here again. Communication very good throughout and during our stay. We had a great time and thank you for our stay at the villa. Fantastic time loved the villa and found Agni travel very helpful . Villa Rosamar was a perfect Villa for a couple of young girls looking for a place of privacy, space, clean well equipped kitchen. The outdoors provided us with lots of privacy and nice place to throw a BBQ. Lots of positives about the villa. The location was really excellent as it was only a short walk down to the front each day either to the supermarket, or the eateries and bars. The pool itself was great and having steps into it was a real help for everyone to use. The layout of the house was lovely and the new furniture in the living room was very clean and comfortable. The bonus of having air conditioning was also a huge plus for our stay and made sleeping in the evening really comfortable. The beds were lovely and comfortable to sleep in, and seemed to be very new, but need to be looked after of they are stay this way. The kitchen had all appliances and the fridge freezer was excellent. However, it was really disappointing that as we had a late flight and therefore, a late arrival, there wasnt even a bottle of water in the fridge when we got there to have a drink and we just managed to get to the Spar before it closed as out flight was delayed - I think this is quite mean for the company as a bottle of water costs so little, but would have been a really nice gesture, and a basic. The only thing we were given was one toilet roll per bathroom - this doesnt really show great hospitality considering the cost of the week, in addition the breakage fee, and the additional amount paid to remain in the villa until our evening flight back. The villa could also do with some nice new bath towels for guests to use, the ones provided were acceptable, but some had holes in, and were only really bigger than hand towels. Also the tea towels left in the kitchen had definitely seen better days. They were faded and a bit grubby - not something we were keen on using really. The house is a bit dated and needs some TLC. The bath in one of the bathrooms need to be looked at as some of the metal is rusting underneath and breaking up on the floor. 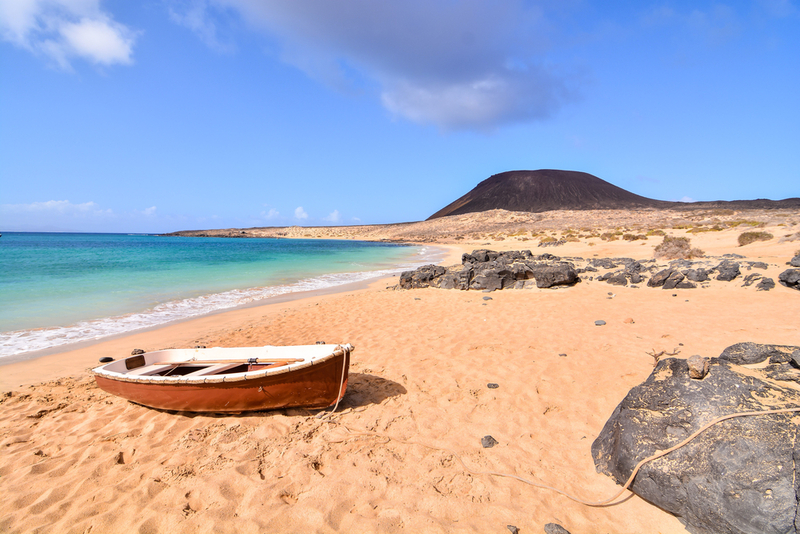 On balance, we would stay there again, but having been to Puerto del Carmen on several occasions, there are other villas where there is more attention to detail, and a nicer welcome than two rolls of toilet paper! Villa Rosamar is in a really good location with easy access to beach, shops and restaurants. It was maintained and perfect for a family holiday. For only being a two bedroom villa, this villa was extremely spacious. The living area was very large and comfortable and the kitchen was huge and fully equipped. The pool area was very nice and the pool stayed very warm during our entire stay. It is also located in a very good area. It was very easy to walk to the beach, restaurants, the supermarket, and a short drive away is a great golf course which my husband loved. A great villa that I would recommend to everyone. Just returned from this lovely villa. Spacious inside and well equipt kitchen; very clean on arrival. The pool is enclosed and heated, so completely protected from the afternoon breezes: we very very much liked that. BBQ was great. Short walk to shops etc and pretty village. Couldnt fault anything. Booked this property specially for my mother, who is disabled in a wheel chair. It turned out to be the most perfect choice. The Pool is secluded and the steps down into the pool enabled her to go swimming; which is a special treat for her. The pool was like a bath; the temperature (considering it was January) just perfect. The surrounding area is flat, so we could easily go out each night for meals with her Wheel chair. The property is larger inside than we expect; with master bedroom on one side and the other bedroom on the opposite side, so gave us privacy from my mother when we needed it! It was a memorable holiday and one we definitely want to repeat. Thanks to Sherrif for recommending some local restaurants and also helping me connect to the WiFi. Top service. best villa holiday we have ever had. Thank you very much. Our stay at Villa Rosamar was all that we had hoped for.... very relaxing villa, had everything we needed, it was spotlessly clean. Would happily use Agni Travel in the future as they were always very helpful. We had no problems at all with our arrangements. Holiday was ideally placed for beach road network airport shops and restaurants which is why we chose it. Excellent and will choose Agni again if we want to go where Agni properties are available. Overall we had a really good time the and villa was in a nice location the only negative is although the pool is lovely, if there are younger children who cannot swim visiting the villa it is very deep so it could be an issue for future guests. Good location, lovely villa and Agni Travel for very quick to respond to any issues. The photos are an accurate representation of the property. We had a lovely time and are seriously thinking about returning again next year. It was in a very good position for walking into Play del Carmen. Very quite and peaceful. We loved every minute of the holiday! I was very pleased with the support from Agni Travel when I needed to correspond with them about information required. I would not hesitate to use Agni Travel in future and would recommend them to friends and family. Accommodation was excellent the Location of the villa is perfect for getting into town. It is only 15 mins from airport which helps with the cost of transfers.We will like to come to this villa again. We had a fantastic week in May 2016 with my husband and 2 boys. It was a perfect location for us as it was lovely and quiet and walkable to the restaurants and shops. Clean and well presented property definitely recommend. I loved this property, enjoyed every bit of it! A fantastic villa, superb location, excellent amenities, spotlessly clean. We would not hesitate to book again, a ten out of ten experience. We thoroughly enjoyed our stay at the Villa and wouldnt hesitate to use again. As a family of 4 it fitted our requirements perfectly. We had a wonderful holiday the service from Agni Travel was first class. I would have no hesitation in recommending Villa Rossa. The property is lovely, well equipped and within walking distance to the seafront restaurant pubs. Chilling out around the pool was just what we needed to recharge the batteries. 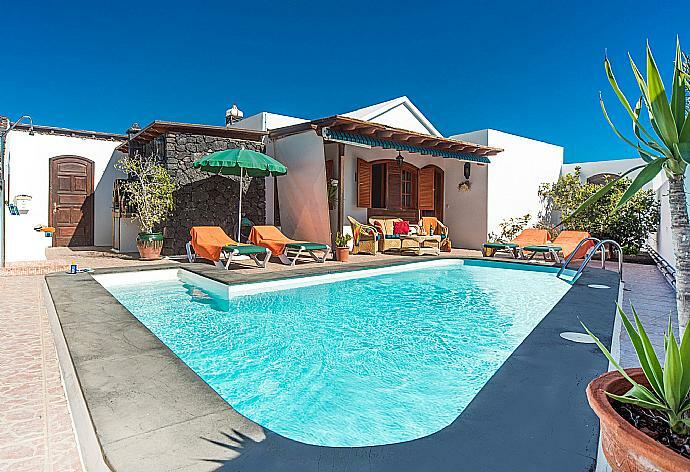 Villa is in a good central location within easy access to everything at Peurto Del Carmen. The facilities at the villa are of a good standard and we particularly welcomed the free WiFi. All in all we had a great week here. We would definitely recommend you and your villa to our friends.We had a lovely time. We think the brochure description is totally accurate and fair. The photos are also true to what it looks like in real life. We had a lovely holiday in Lanzarote. Villa Rosamar was perfect very clean very spacious nicely decorated furnished. Pool was lovely and warm! Villa walking distance to beach. Everything you could need was there. It ticked all the boxes. Plus, the service from Agni was brilliant. I would definitely recommend this property we will be back.Thank you. Villa Rosamar was booked Yesterday!